I rarely attend blog events but this one I’m particularly excited for because of the bands who will be performing (hopefully I get to shoot them, whee!) and the seminars they will be having in the afternoon. It’s like hitting two birds with one stone, haha! Most importantly, I get to see my college friends again. And, it’s mildly close to home, so yay! I get to go home at night with not much problems. Let’s see now. . . I think the last blog-related event I went to was Wordcamp 2010, which was held at De La Salle-College of St. Benilde. I noticed that I only get to attend WordCamp events if they’re held in my school, lol. Everything you need to know about the event is down below. Hope to see you there!! Give each side a chance to air their story—that’s one simple solution to settle the long-standing feud between pro and anti-Internet piracy supporters. 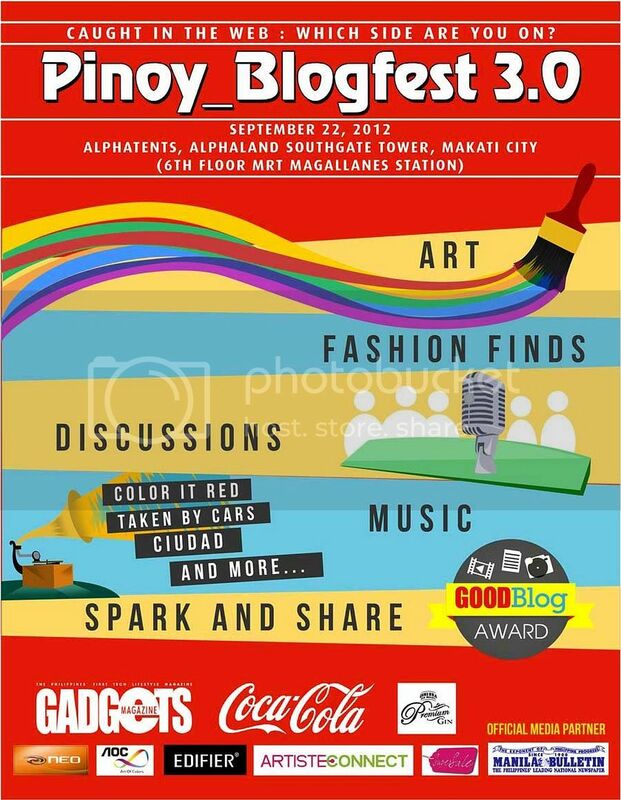 Pinoy Blogfest 3.0, an annual event staged by Gadgets Magazine, aims to do just that. Everyone—no matter which side of the piracy issue you’re on—is invited to be part of this instructive yet fun event, happening on Saturday, 22 September 2012 at the Alphaland Tents (EDSA cor. Chino Roces, near Magallanes MRT station) in Makati City. The series of activities starts out with a digital photography workshop courtesy of Canon Philippines. Also lined up to talk about internet piracy, its effects, and how online movements are bridging the gap between consumers and content-makers are Atty. Ann Edillon of Bengzon Negre Untalan (BNU) Intellectual Property Attorneys, Diego Mapa of OPM bands Pedicab and Tarsius, and Mark Laccay from local creative funding platform Artiste Connect. Color It Red, Taken By Cars, Ciudad, and other local OPM bands will be there for special guest performances. You can pick up gifts and prizes from our sponsors when you participate in the activities. You can also pick out awesome finds in our fashion aisle courtesy of Supersale Bazaar, while gaming rigs will be set up for those who want some free gaming action.